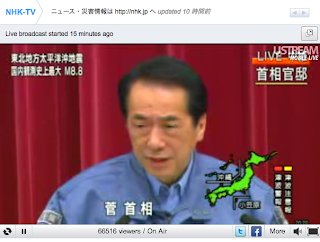 Japanese broadcaster, NHK, has turned to Ustream to further spread it's live coverage of the aftermath of the recent earthquake off the coast of Sendai. I managed to catch the Japanese Prime Minister, Naoto Kan, talking to the nation just now on this channel. Google has set up a crisis response website linking to all kinds of useful information and promoting it's "person finder" service by spreading the widget below. Notice the choice of languages: Japanese, Korean, Simplified Chinese and Traditional Chinese. An alternative version of the news coverage is also available on Global Voices.